With fantastic views of the open countryside from the pool terrace, living area and both en suite bedrooms, Villa Yellow Stone is a superb choice! There's also plenty of space around the private swimming pool for sunbathing. Avlaki Beach can be reached either on foot or by car and a choice of shops and restaurants are also within an easy 5 minute drive. This charming villa is bright and airy and includes air conditioning/heating in the bedrooms, WiFi and pool heating. The spectacular countryside views from Villa Yellow Stone are what a Corfu villa holiday are all about! Although Villa Yellow Stone is semi-detached with Villa Pietra Gialla next door, the infinity style swimming pool faces the open countryside, in the opposite direction to its neighbour. There is a good deal of terrace space for relaxing and admiring the scenery. There is also a brick BBQ, by the side of the villa, as well as a shaded table and chairs, for alfresco dining. The villa has its own private gated driveway and the parking area is to the right of the entrance into the house. The living area is spacious and open plan, with traditional stone coloured tiles. There is a seating area and a table and chairs, as well as a breakfast bar by the fully equipped kitchen. Double patio doors open onto the dining terrace at the side of the house. There is also a WC adjacent to the kitchen. There is a twin bedroom and a double bedroom, both on the first floor. Each has an en suite bathroom and a private sea-facing balcony. This villa is registered and licenced by EOT Greek licensing association. This number is: 0829K10000417901. Villa Yellow Stone has a great position, close to the beautiful Avlaki Beach, which offers a couple of waterside tavernas and some superb scenery. You can easily reach the beach by car in around 5 minutes, whilst for keen walkers there is a shorter route down a fairly steep pathway. The village of Sinies is also a short drive away, as are the larger resorts of Agios Stefanos and Kassiopi, which offer a good selection of shops, bars and restaurants. Villa Yellow Stone is situated between the popular resorts of Kassiopi and Agios Stefanos. The charming village of Agios Stefanos is within a 5 minute drive and has 2 well-stocked mini markets, which offer a delivery service. Kassiopi is around 10 minutes' drive north and has a larger selection of souvenir shops, as well as places to grab daily essentials. Both Agios Stefanos and Kassiopi also have a good selection of waterside tavernas, cafes and bars. 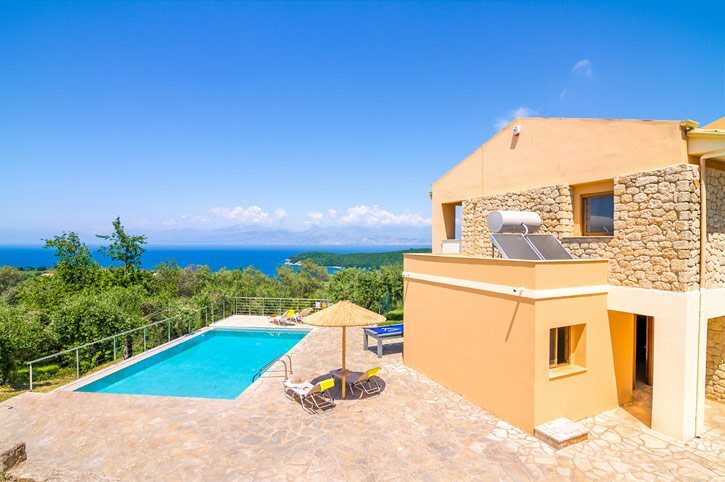 Villa Yellow Stone has a hillside setting overlooking Avlaki Beach. The beach is only 700 yards away on foot down a steep pathway, or around 5 minutes away by car. The beach has a small choice of tavernas overlooking the water. Avlaki Beach is pebbly and unspoilt with turquoise water. Alternatively, the beaches of Kassiopi and Agios Stefanos are also within a short drive or boat trip. There is a choice of waterparks on the island. The nearest is Hydropolis in Acharavi but the largest waterpark, Aqualand, is around an hours' drive back towards Corfu Town. There are various attractions and places to visit on the island. Enjoy the pleasant 40 minute drive up Pantokrator Mountain, the island's highest point. The views from the top are stunning! A visit to Paleokastritsa on the West side of Corfu is a must-see for anyone wanting to experience a true taste of Greece, or spend a day in Corfu Town which has a huge choice of gift shops, restaurants and the old and new forts to explore! Corfu Golf Course is around an hours' drive away in the Ropa Valley. There is a windsurfing and dingy sailing school in the bay with canoes and pedaloes for hire should you wish to explore the nearby coves on this picturesque area of Corfu. Drier activities include horse riding. Only a short distance away are horse stables providing treks through the beautiful nature reserve of Erimitis. Villa Yellow Stone is not available to book for season as it is sold out. Take a look here at the Corfu villas that are currently on sale. Beautiful villa with stunning views - peaceful and the kind of place you'd want to come back to. The villa was very nice, the views were fantastic. It was well looked after and very modern, we would book it again. My wife and I relaxed in the peace and quiet. We are so happy with our holiday that we will be booking up with villa plus at the same villa next year as we have decided to get married there as it was so lovely, thank you so much for a wonderful time.